The Great Barrier Reef Marine Park hosts a rich and diverse maritime cultural heritage. There are nearly 800 recorded ship and plane wrecks resting at the bottom of the Great Barrier Reef Marine Park, with very few discovered. The shallow nature of some reef areas and the region’s susceptibility to storms and cyclones has contributed to the large number of wrecks. Wrecks provide a unique experience for visitors by providing an insight into history and past events, as well as a haven for abundant marine biodiversity. Shipwrecks are sensitive areas and need to be respected. 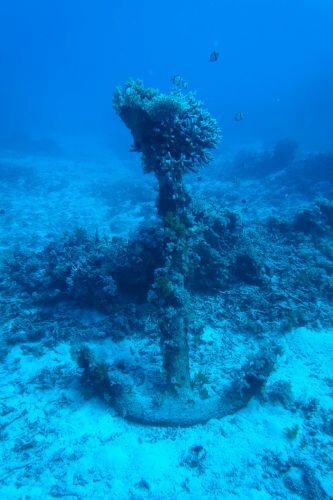 In addition to the protection provided through protected zones and special management areas, there are responsible reef practices for visitors to follow. 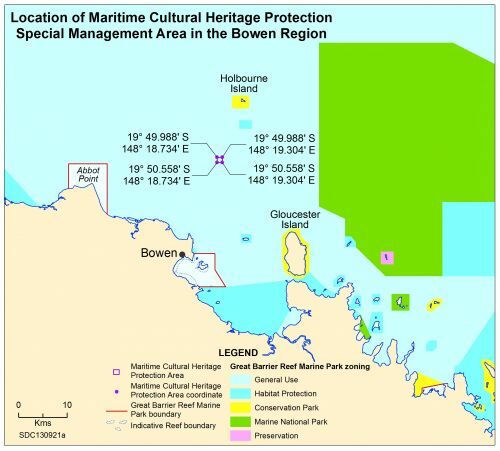 The table below outlines the six historic shipwreck protected zones under national maritime heritage legislation in the Great Barrier Reef Marine Park. A permit is required from the Australian Environment Department to access these sites. 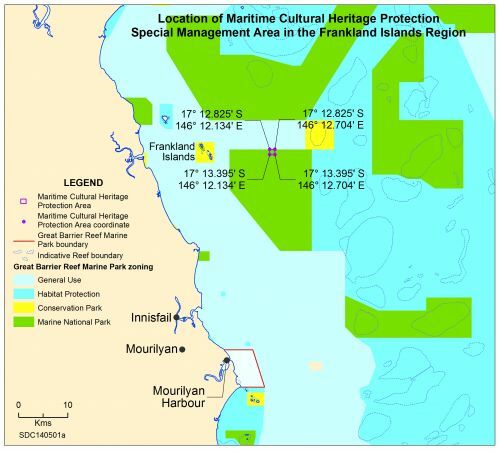 Two nationally significant Royal Australian Air Force WWII aircraft wrecks, shown on the following maps, are also protected through special management areas and a permit is required from us through permits online to access these sites. Two nationally-significant Royal Australian Air Force WW II aircraft wrecks are protected in the Great Barrier Reef Marine Park. Two special management areas — each one kilometre square — are in place around a Catalina off Bowen and a Catalina that crashed near the Frankland Islands south of Cairns. Boats can travel through the special management areas, but cannot stop (unless in an emergency) and cannot conduct any fishing activity or anchor. The special management areas are part of the Zoning Plan. Being particularly sensitive areas, if you break the rules there are significant penalties . Those wanting to access these sites for cultural heritage purposes, including monitoring, research and stabilising the wreck, will need to apply to us for a permit. The Australian National Shipwreck Database can be used to find names, locations and information on shipwrecks. The Queensland environment department has Dive Guides available for the Yongala, Gothenburg and Lady Bowen shipwrecks. The Queensland Museum developed Conservation Management Plans for the SS Yongala, SS Gothenburg and QGS Llewellyn. The Department of Environment and Science and the Great Barrier Reef Marine Park Authority are reviewing these three plans and developing new Conservation Management Plans for Foam, HMS Pandora and HMCS Mermaid. Contact the Queensland environment department for more information. The Magnetic Island Shipwreck Guide highlights the 20 plus shipwrecks around Magnetic Island and includes best practice guidelines. The Historic Shipwreck Foam (1893) Survey Report 2015 was prepared and published as part of the Authority’s Research Publication Series.